However Improbable: "They switched subjects back to something Jack knew better, such as swords and fighting." "They switched subjects back to something Jack knew better, such as swords and fighting." Well, looks like I'm back to publishing with Lulu. Since even I wouldn't buy my own book for 45.00. Still trying to figure out the e-book though. This book today is written by Natalie Bahm. You can find her blog HERE! 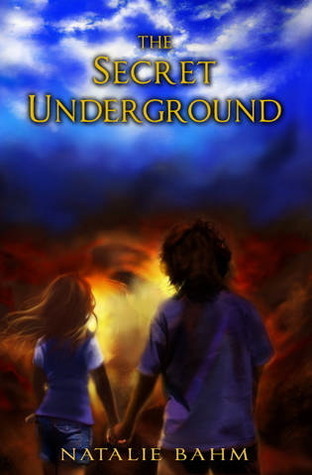 The book is titled The Secret of the Underground and it is a children's book though it sounds like it will be a fun, adventurous story. Twelve-year-old Ally is the only witness to a bank robbery in her small town. Unable to block out the memory of the robbers, a notorious gang known as the Gauze Men, Ally joins her little brother and a bunch of neighborhood boys digging a hole in her backyard. Only the hole isn't just a hole - it's a massive set of tunnels snaking beneath the neighborhood and heading for an abandoned steel mill. Ally is old enough to know the danger, but she reasons spending time with sixth-grade heartthrob Paul is more fun than sitting at home with her worries. And dangerous it is - none of the kids' parents realize the tunnels exist, but the Gauze Men might. I saw this book, the cover, before I knew of Jemi's intentions with it and the cover interested me. (To be honest, it reminded me of Rick Rodiern's almost, or other adventure books I have read.) And since I love a good adventure story, a fast paced, fun one, I quickly added it to my list. Aw, good, I found something about the baby boy Natalie is helping. Click HERE to learn the full story. Again, don't forget about the giveaway I am holding! The winner will receive a free, signed copy of my book! You can read the rules HERE!! Quote is from Mothstorm. A kind of rough quote as I don't remember it word for word. Erg! A book to add to my TBFAR (to be found and read) list. It sounds amazing! Oh, a question, what format are you trying to upload book to KDP in? It occurred to me last night that that might be your Kindle issue. Might. Send me an Email. First of all, I want to thank you for your continuous support on my blog. It means a lot to me. Up until now, I couldn't find your blog. When I clicked your avatar, no links to your blog showed up. So I am so happy it finally did and I could come visit you. I'm making a long list of books I will someday read, all based on your recommendations on your blog. It's getting quite long. This is yet another one to add. BY THE WAY, I LOVE the new look of your blog! I think it's perfect. I'd love to do something like Ms. Bahm did -- use the profits to help someone, whether it be with medical bills or a mission trip or anything like that. I actually hadn't heard of doing that sort of thing before, but it's a great idea. Also, "Gauze Men" is such an intriguing term. Ih ope publishing goes well. I'm planning on buying the book for my brothers for Christmas, and if not by then, then for a birthday, and I know they'd appreciate a hard copy much more than an e-book. Sounds like a fun book! I hope she gets tons and tons to help the baby! I can't WAIT for your book to come out! I want to read it so badly! It's going to be so much fun! Thank you so much for highlighting THS SEÇRET UNDERGROUND, Jack! It's been such a rewarding project. Best of luck with your book too! I hope you're able to get your book issues figured out! Have you tried emailing Amazon at all to see if they can resolve your problem? I hope John is able to get back to blogging soon! Tell him I miss his posts! Oooh, sounds like a very interesting book! I'll have to check it out.... And Gauze Men, how intriguing! That sounds good. :) I should try and read it when I have more time.